If I owned a Bed & Breakfast, I would probably … wish that I didn’t have to clean house everyday. No that’s not what I was going to write. I was going to tell you that I would probably make this Blueberry Breakfast Cake for every-single-one of my guests. While we don’t own a B&B, we do have out of town company from time to time – so given the recently renovated guest bathroom and this great recipe, maybe we’ll get some visitors soon? My husband does a great driving tour of DC! You know you want to come just to have cake for breakfast – and that’s okay with me! I have three brothers and three sister-in-laws (plus one sister). My sister-in-law Briana and I have a lot in common especially when it comes to baking and recipes. She sent me a recipe for Blueberry Breakfast Cake that she made on Mother’s Day, because she knew I would love it. The original recipe was posted by Alexandra on her blog at Alexandra Cooks. Since June 2011 she has had 1,600+ comments on this post. That is a serious endorsement of this recipe’s popularity and after seeing her post, how could I NOT make this wonderful creation? I made only tiny adjustments to the original recipe – a little less sugar, baked at a lower temperature in an 8″ springform pan, half the salt, with raw sugar on top, etc. The recipe calls for buttermilk which performs amazing magic on this “coffee” styled breakfast cake. It’s moist and absolutely stuffed with juicy, ripe blueberries. With a little hint of lemon and a sugary crunchy top, this is a must make for your culinary bucket list. My husband wouldn’t even share this with our favorite taste-testers – now that’s an endorsement! I want to host a brunch just so I can make it again, or open a bed & breakfast and serve it every day. Grab a cup of coffee and pull up a chair. You’ll want to visit a while! 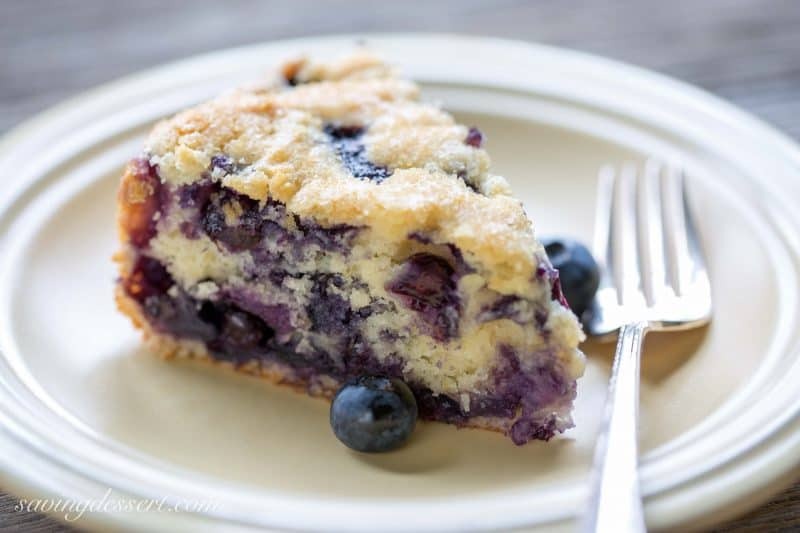 A deliciously moist, lightly sweet "coffee" cake bursting with juicy ripe blueberries. Allow the cake to rest for 30-minutes before removing the sides of the pan. Serve warm or at room temperature. To keep longer, refrigerate leftovers. The warm cake will crumble a little more than a cooled cake but it's absolutely delicious. Recipe can also be baked in a 8x8 or 9x9 square pan. Watch the baking time in the 9x9. Blueberries are a favorite in our house. They have the most amazing flavor and can be added in to almost anything baked. These Easy Blueberry Crumb Bars are absolutely fantastic, and who doesn’t love these amazing Lemon Blueberry Muffins with Crumble Topping too?! Blueberries really shine in homemade pies like this Blueberry Buttermilk Pie and this super popular Blueberry Crumble Pie. And don’t miss this wonderful Blueberry-Lemon Icebox Cake which is the perfect make-ahead dessert for company this summer. 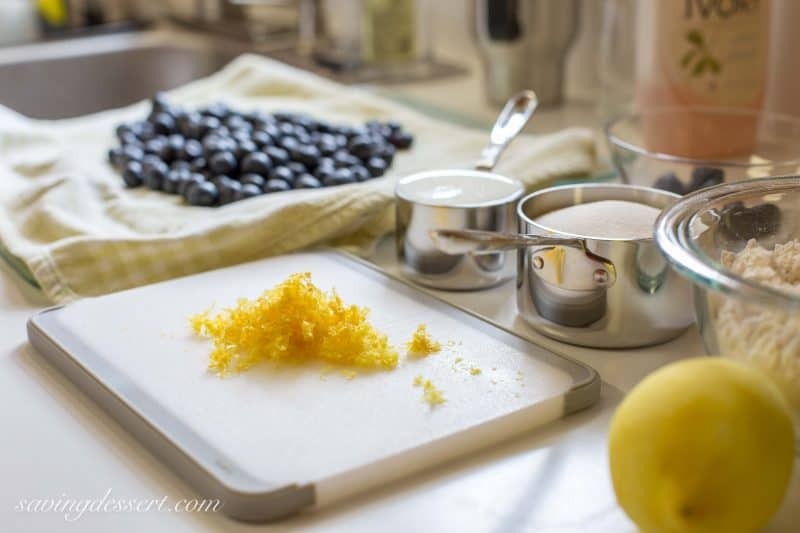 Check out these Lemon Blueberry Cupcakes from Oh Sweet Basil – I really love the beautiful color! I can’t stop thinking about these beautiful glazed Blueberry Lemon Hand Pies from Shugary Sweets – I’m practically drooling! And don’t forget to add blueberries to your savory dishes too like this lovely Blueberry Apple Walnut Salad from Barefeet in the Kitchen. Are you grilling this weekend? I want to – especially if it involves sitting on the deck and doing nothing. I’m thinking it’s about time for a vacation too. I can see “leisure time” in my future. Hope you have a wonderful long holiday weekend! Happy Memorial Day. I made this and the batter was so stiff, I put half in the pan and then the blueberries and topped it with remaining batter. It is in the oven now and I am doubtful how it will turn out. seems 50 to 60 minutes is a long time to cook. I will be checking it. Could something be left out of the recipe…like enough liquid? Hi Judy. Sorry you’re having trouble with the recipe. As you can see in the video this has a very thick batter. The recipe is correct as published and the baking time is okay too. Make sure you are gently scooping your flour into the measuring cup and leveling it off with the blunt edge of a knife. Also it helps if the butter is very soft, but not melted. Hope this turned out better than you expected. Would love to hear back from you to see if it was okay. Thanks for trying our recipe. I made your Blueberry Breakfast Cake. It came out wonderful! Nice and light and not too sweet!! Thanks so much for the feedback Jacqueline. 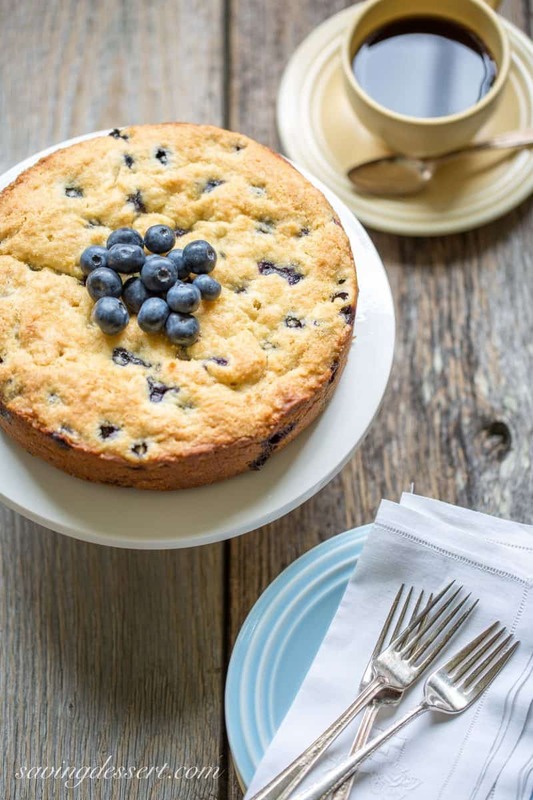 We love that cake and blueberries are always a favorite. I hope you got a piece when it was slightly warm – soooo good! Thanks for trying our recipe and for taking the time to let us know how it worked for you. Take care and have a wonderful holiday season! 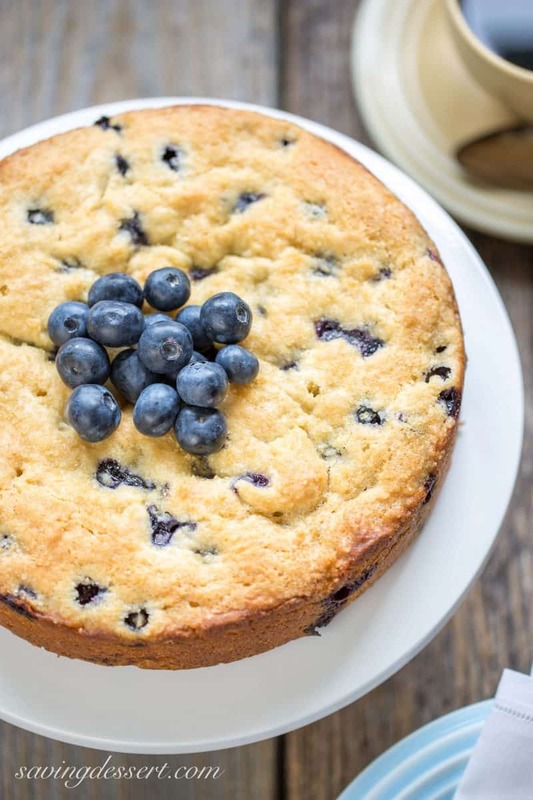 Can the blueberry breakfast cake be made with frozen berries? How about using huckleberries? Hi Ramona. I think it’s fine to use huckleberries but if you’re using frozen blueberries I would not fold them into the batter as the color will bleed. If I was using frozen berries, I would layer some batter then sprinkle on frozen berries, layer batter, berries, etc. I don’t know if the frozen berries will sink more to the bottom since I have not tested this recipe with frozen blueberries. Fresh seem to be the best option for this recipe in my opinion. Good luck and hope you love the cake. Hi Marcella. I always try applesauce first when looking for a substitute. I would start with substituting half the butter with unsweetened applesauce. Another good substitute is a neutral tasting oil. I love all our breakfast cakes – hope you’ll give them a try! I was given bags of frozen blueberries, can I use them in your recipes? Thank you your recipes looks delicious. Thanks for the great question Rebecca. I haven’t tested this particular recipe with frozen but am sure it will be fine. I would layer the blueberries in the pan instead of mixing them in as they will bleed and leave the batter streaked with blue. You don’t need to thaw the berries first – they should be fine. I would layer 1/4 of the batter in the pan, then 1/4 of the blueberries, etc. Good luck and hope it works out for you. Sounds like a great gift – bags of blueberries are wonderful! This recipe sounds delicious—will be making it very, very soon…tomorrow! Have you ever made it using raspberries? If so would you still recommend grated lemon or orange? Hi Patricia – so glad you’re going to give this a try. It’s so good! I have made a very similar cake with raspberries and ricotta. Here’s a link: RASPBERRY RICOTTA BREAKFAST CAKE.. If you prefer to use the blueberry cake batter, I know the raspberries will be terrific in it too! Or a mix would be fun too. I would use frozen raspberries because they don’t break down as fast as fresh. Good luck and thanks for the great question! Made this today….My batter was very thick and I followed the recipe to a T. I made in an 8 inch dark metal cake pan. I had to bake it 2 hours at 325 to get it done. Can you give me some pointers? 1/2 c buttermilk just doesn’t sound right to 2 cups flour. Did you sift the flour? Hi Stevee – I make this recipe often and have never had to bake it more than 60 minutes. Also, the recipe is correct as written with 1/2 cup buttermilk to two cups flour. I don’t sift the flour. If you watch the video, you will see the batter is super thick. I’m not sure why you had to bake this for 2 hours, but I would check your oven temperature to make sure it is baking correctly. Thanks for giving our recipe a try. Perhaps you can try baking this cake in a 9-inch square pan next time. Also increase your oven temperature to 350F and see if that helps. Good luck! This is a flavor combination I never tire of! Can this be frozen? It looks fabulous! Hi Marcia – I think this cake would be fine to freeze but hope you can try it slightly warm! So delicious 🙂 Thanks for giving our recipe a try! Thanks Brayton! We LOVE, love, love this cake 🙂 Perfect any time of day. Thanks for the feedback and for trying our recipe! I made this today to serve to some guests this morning. Everyone loved it! I used frozen berries and a 9″ square pan, baked for 45 minutes and it was perfect! I am dying to try this recipe, but I am currently running low on blueberries. I do, however, have an abundance of cranberries. Have you tried a variation of this with cranberries? Do you have any recommendations if I do make the substitution? Perhaps a little more sugar and/or swap the lemon zest for orange zest? Any help would be much appreciated! Hi Makenzie! I have made a variation of this cake with cranberries – check out this recipe for CRANBERRY ALMOND CAKE and see what you think. We love the almond cranberry combination and think it’s a great way to use up some of your cranberries! Good luck and thanks so much! A little late to the party on this one but I made it this Sunday for breakfast. It was a huge hit with the family and all of it is gone! Can I make this with frozen blueberries? Do I thaw first? Hi Ashley – I have not tested this recipe with frozen blueberries but if I did, I would leave them frozen and gently fold the blueberries in at the last minute. Frozen berries tend to bleed color into the dough so the cake may not look like the one in the photo. It will taste just as good but may have streaks of blue which is not a bad thing, just different. Thanks for asking and I know you’re going to love this breakfast cake! Well I do own a bed and breakfast inn and after reading all these comments, I am making this for the coming weekend’s guests! Or maybe this afternoon for just my husband and I!! Looks very good! That is so wonderful Barbara – you are a hard worker owning your own B&B! I know you will love this recipe and when I come to visit – I hope you’ll make it (or your adaptation, for me!) Best wishes and thanks so much for reading the blog. Sheena – thank you so much for letting me know! I hope you post it on your blog. So many people need good gluten free recipes. I hope you had a wonderful vacation – or are having a wonderful vacation. I can’t wait to make the cake again – it really is very good. Good luck and thanks again! See, I am a little bit of a piggy so I would want this as a breakfast, lunch and dinner cake! Have a great day Tricia. 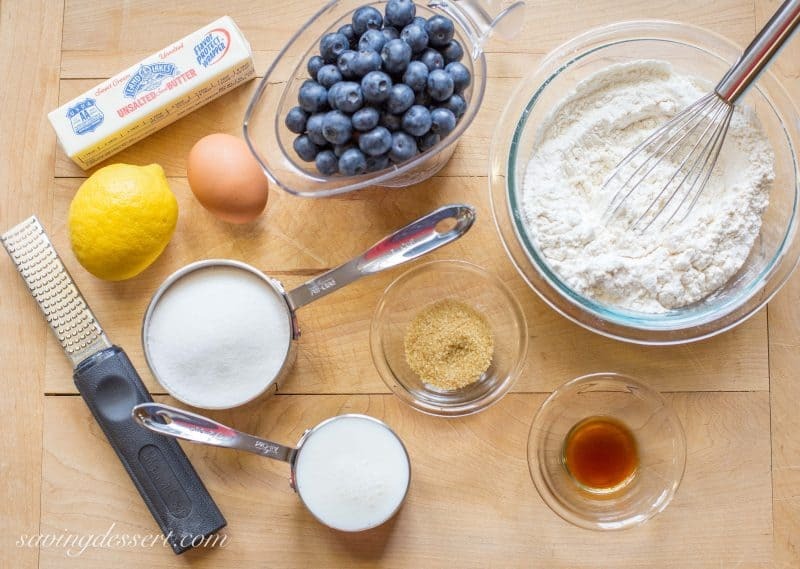 I made this Blueberry Breakfast Cake immediately upon seeing your recipe. I am at a loss as to how to describe how much I loved this cake. It disappeared in 1 and 1/2 days. Just my husband and I here to eat it mind you. I loved the texture, the lemon cake, the slight crunch to the sides of the cake with each bite, the blueberries. Actually I think I may make the lemon cake with nothing in it~so good! Thank you for another great recipe. You are a fabulous cook! That was the most amazing comment I’ve ever gotten! Thank you so much Elaine – you made my day. It is one of the best cakes I’ve ever made – love, love, love it and so happy you did too! My husband and I didn’t share it either and I can’t wait to make it again. Have a wonderful week and thank you so much! Thank you Elaine – have a lovely weekend! Hi Anna – this is a wonderful cake – served for breakfast, lunch, dinner or a midnight snack – can’t wait to make it again! What a great recipe, I pinned it and plan on baking it next week when I have a house full of guests. Thanks Lorraine – you can be our first customer! I admire people at own B&B’s. I don’t know how they do it with very little down time. But, this would be perfect on the breakfast, lunch or dinner menu – very good cake. Hope you give it a try! My sister is coming in August and I’m making this cake for her on day one! You are so right Maureen – I wouldn’t want to work that hard – haha. Decorating and changing sheets everyday doesn’t sound like my cup of tea. But … I would make this cake and I am so glad you’re going to share with your sister. She will love it to! Have a wonderful week. I can see why you made this and why it’s your husbands favourite too. It looks so beautiful. Like a muffin cake? I’d eat it all day! I’ve thought about using it as a base recipe for muffins. Just lovely! Hope you’re having a wonderful weekend. Put on the coffee…I’ll be right over! 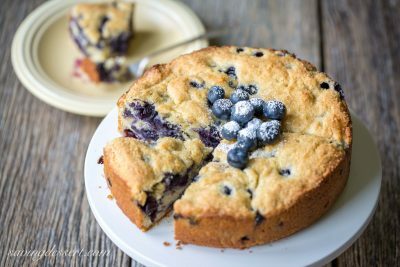 🙂 This is perfect for a lazy breakfast for a long weekend- I’m loving all of those blueberries! I’d love to be your guest at your B&B! 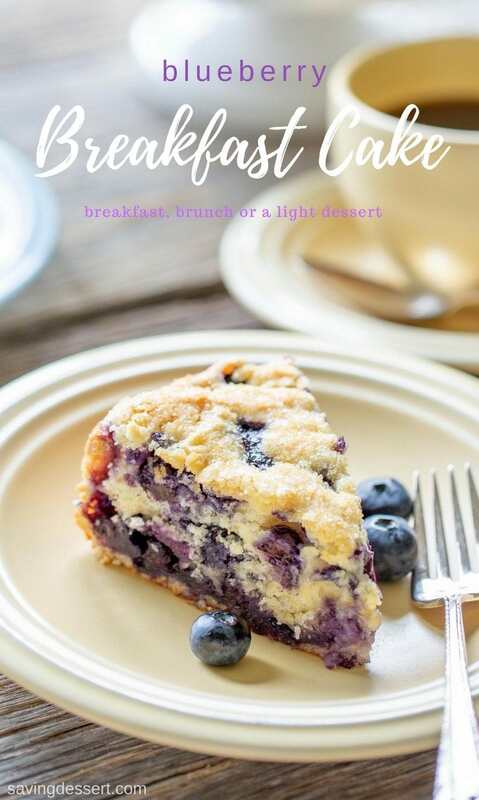 🙂 This Blueberry Breakfast Cake looks delicious and pretty!! This looks delicious Tricia and I really like that it is chocked full of blueberries. Sending it on to the family baker. this cake looks lovely 🙂 i’ld like some for breakfast tomorrow! I think I could eat this everyday! It has such a wonderful flavor, not too sweet, not at all dry, just juicy and moist – and now I want to make it again! Have a lovely holiday weekend. I love this cake! Sort of a cross between breakfast and dessert which is perfect. I think instead of running a B &B, I will occasionally make this cake (gluten-free) and pretend I’m visiting a Bed and Breakfast. No cleaning involved. Dessert at every meal Toni! Guess that doesn’t work but having this cake on special occasions is a great idea. I will be making this for my next family event or work related eat-fest 🙂 Have a great holiday weekend! Okay, twist my arm, I’ll come and be your house guest! Your husband might not like it though as we might be in competition for the last sliver of this yummy coffee cake! Haha Chris – he would share – but maybe just once! Have a wonderful Memorial Day weekend! You won’t be sorry Becky – hope you enjoy and have a lovely holiday weekend! I just settled into our lovely bed and breakfast in Madison and I’m now wishing they were serving us this tomorrow morning! Thinking of you and your family this weekend Sue – hope the wedding is everything your daughter dream of. Have fun! I just know that I would love this.. I think you would too Monique – it is lovely! It really is an amazing cake – hope you’ll give it a try Susan. Have a wonderful holiday weekend. That’s an excellent endorsement! And that’s my kind of cake, too. I’d eat it for breakfast, or for any meal! Any meal works for me too Beth. I do think it is the perfect light brunch or luncheon treat. Or midnight snack – not that I know anything about that! Have a wonderful holiday weekend and thanks for stopping by! A guilty free breakfast alternative, Tricia. I wouldn’t want to share this too. It looks heavenly. It is so wonderful Angie – hope you give it a try with your healthy adaptations. Have a great weekend and thanks for stopping by! What a beautiful cake and I can see how moist it is! Perfect for leisurely weekends 🙂 Have a great long weekend, Tricia. I was just looking at some blueberry muffins this morning but this is taking over my brain! Enjoy the long weekend – I’m so ready! Hey Monica – this cake is worth seconds – it truly is deliciously moist and so full of wonderful flavor. It doesn’t need icing or anything else for that matter. Hope you and your family have a wonderful weekend too! Hey Tricia~~ this looks amazing! Maybe I could actually make this. Of course we could just come visit you and you could have it. We actually are thinking of visiting DC this summer, so, maybe it will work out. Coffee cake, breakfast cake, blueberry cake … I don’t care what you call it – it is amazing with a hot cup of coffee or cold from the fridge. I know this from experience Haha. Thanks for stopping by June!